It wasn't long after the first flights of the F4H-1 that McDonnell realized that it had a winner in its hands. The plane was incredibly fast, top speed only being a result of running out of fuel as those who have flown the 'Rhino' tell me that it just keeps on accelerating. Speed like that is just what is needed for a photo recce aircraft. These planes go into danger unarmed and (mostly) unafraid. With no guns, or missiles, the only benefit they have is speed, and the F-4 had plenty of that, regardless of the altitude. Anyway, the Air Force realized that, once again, the Navy had a plane that was better than anything they had and so fell into line and eventually ordered many more of the over 5,000 built than anyone else. One thing they seriously needed was a fast photo bird so the RF-4 was developed for both the Marines (the Navy never flew the photo version) and for the USAF. It was extensively used in Vietnam and a number of these planes succumbed to either MiGs or missiles over North Vietnam. Other countries that wanted the F-4 saw that a photo recon version was something that they should get, but they wanted the latest and greatest airframe, which by the time they got around to wanting them, was the F-4E. The result was the RF-4E. The type flew with nearly every Phantom operator, though some countries opted for surplus RF-4Cs. Regardless of where the airframes originated, the RF-4E is currently being flown by several countries though it is slowly being phased out in favor of newer airframes. As faithful as the Phantom is, the truth is that once 5,000 flight hours has been reached, time is up. 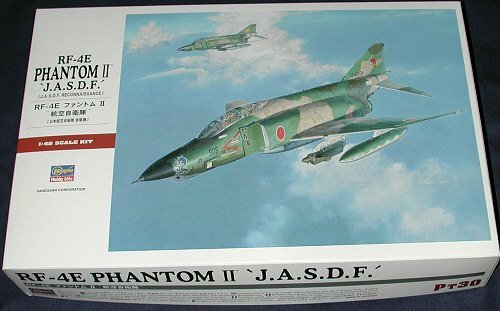 1/48 Phantom Phans have been waiting decades for a Hasegawa to release an RF-4 and finally they have done it. 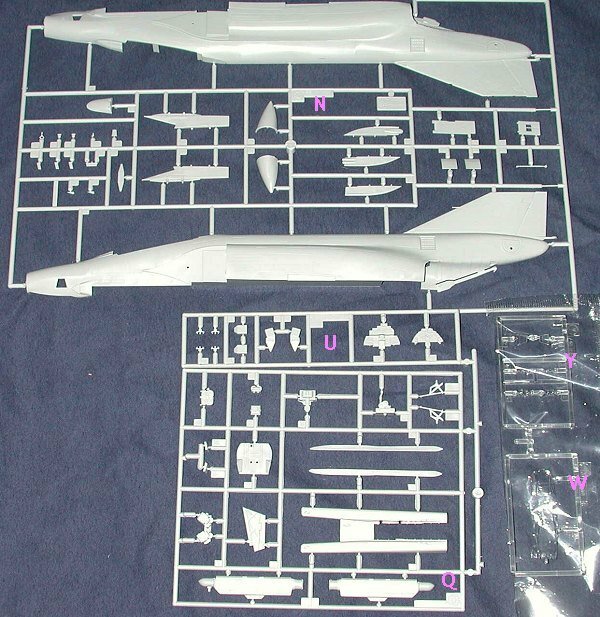 It probably comes as no surprise that many of the sprues are from other members of the F-4 family. However there are five dedicated RF-4 sprues; two of them clear. Those are what is shown in the image above. Now I should point out that there are a few oddities with this kit. Those who have built a lot of Hasegawa F-4 kits realize that the F-4C/D kit is one with raised panel lines. Sprue H (which has the stabilators and inner wing pylons is from this kit so these parts have raised lines. Only the larger F-4E burner cans are provided so one cannot do any US RF-4 from what comes in this kit. Even with aftermarket burner cans for the F-4C, one cannot do a US or German RF-4 as, though the lower nose camera hatch configuration is the older more 'square' style, it does not have the same window configuration. US and German RF-4s have a wedge shaped camera window the juts down from the aft bay door that the Japanese aircraft doesn't have. (sentences updated, ed). I wouldn't sweat too much on this as you KNOW that there will be a good dozen or so boxings out of this kit that will include all these differences! I should also mention that the wings are 'hard' and have no combat maneuvering slats. So what are the new bits? Well, starting with the largest, the N sprue has new fuselage halves, pylons, fin tips, nose gear doors, flare doors, nose cone and some antennas. Next largest is the Q sprue with a cockpit side panel and back wall for the camera bay as well as cameras for the nose, a blanking plate for the forward and aft Sparrow bays and an ALQ-101 jammer pod. Attached to it is the U sprue with new instrument panels, pylon anti-sway braces and flare/chaff dispenser pods for the side of the pylons. The two clear sprues include the W sprue with the later lower nose panels and the Y sprue with side camera windows, landing light windows and a couple other smaller clear bits. Instructions are quite complete and let you know all of the filling, cutting and drilling needed to do this particular version of the RF-4. It seems that the nose camera bays are not designed to be displayed open, but ingenious modelers will be able to figure a way around that. I should also mention that the planes just as often flew without the cameras installed as they did with them. Since all the decals are for a photo meet, it would be appropriate to inst all them if using kit decals. Apparently the Japanese RF-4s were not modified for self-defense so you can relegate the Sidewinders to the spares box. You also get an F-15 style centerline tank and you will have quite a few spare bits as well! 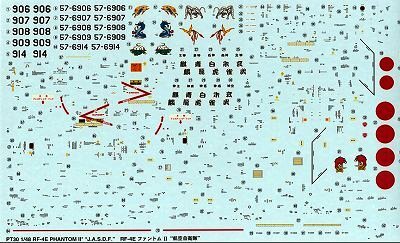 The decal sheet is quite extensive with seemingly zillions of small stencils, but Hasegawa has helped us out by grouping a lot of them under the same carrier. This is either a blessing or a curse, depending on how you feel about data markings! The sheet fills my scanner so putting on decals will not be a short time deal. It includes marking for five different aircraft of 501 Sq during a photo recon meet in 1994. Each plane is adorned with very nice nose art, making for a most interesting presentation. Colors for JASDF RF-4s for most of their lives were FS 34097, 34108 and 30372 uppers with FS 16440 undersides. My experiences with modern Hasegawa decals has been quite positive and I expect these to be just as good. Am I thrilled that a Hasegawa RF-4 is finally available? Durn tootin' I am. I've loved F-4s for decades and the ability to have a ready-to-go RF-4 without having to resort to conversion sets is something I've been waiting for. I anticipate a flurry of aftermarket RF-4 sheets and resin add-ons to hit the market soon! If you would like your product reviewed fairly and fairly quickly by a site that has nearly 250,000 visitors a month, please contact me or see other details in the Note to Contributors.